There are several methods for getting a list of all serial (COM) ports on a Windows machine. Here I want to focus on one that seems to work very well on the computers I tried, and incidentally it's also the simplest to implement. The list of serial ports on the machine appears under the HARDWARE\\DEVICEMAP\\SERIALCOMM key in the Windows registry. You can use the regedit tool to reach this key and make sure the serial ports defined on your machine are there (including the virtual ports created with com0com or another emulator). There are other methods for listing the serial ports, but for the time being I'll stick to this one. 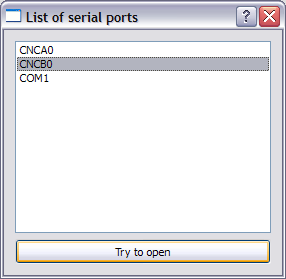 While the "simple" name returned by enumerate_serial_ports is readable and suitable for display to the user, only the full name can be passed to serial.Serial for opening the port. Finally, I've coded a simple PyQt based GUI for listing the available ports and allowing the user to try and open them (even if the port appears as available on a computer, it may be in use by another program - so opening it will fail). Here's the code. It assumes that the enumerate_serial_ports and full_port_name functions were placed in a module called serialutils somewhere on the Python path. Also, note how the simple port names from enumerate_serial_ports are shown in the list widget, and when trying to actually open the port, the program converts them into full names "under the hood". This is a common practice in serial-port programming. This runs with ActivePython 2.5.2, PyQt 4.4.3, and the latest PySerial. Some utility code for this post can be found in this directory.